FAQ: Do You Get To Eat That? How will I be able to review proofs of the images after the shoot? After each shoot I will provide you with a password protected link to an online gallery to review proofs of the images. The gallery will be available online for three months following the shoot date. Each gallery has a Light Box feature which you can use to choose and organize your selections. How soon after the shoot will I be able to proof my images? In most cases I will be able to have low resolution proof images online for your review within 48 hours following the end of the shoot. Complex shoots may take longer to process. Can I get printed proofs of my images instead of an online gallery? In addition to a digital gallery I can provide hard copy proofs and sample images, usually within several days following the end of the shoot. Pricing and delivery time are dependent on the number of images and your location. What sort of post production do you do to the final images? Most images require a minimum amount of post-production. All images from your shoot include standard post-processing which includes exposure correction, color-correction, and tone. Retouching is also available as well for an additional fee. I like to capture images as perfect as possible “in-camera” to minimize the amount of post-production retouching as possible. However, in some cases retouching is unavoidable. Retouching costs vary depending on the number of images and the complexity of the retouching required. If a project requires extensive composite work or creative retouching, I work with a dedicated retouching professional to provide you with the best possible final product. Your final images will be delivered to you via password protected web gallery. You will be able to download low, medium and high resolution versions of the images. Web galleries will remain online for three months following the end of the shoot. Electronic transfer via FTP is also available. Can I get my images delivered on DVD? Image DVDs can be ordered at any time. Pricing varies based on the number of DVDs ordered and shipping method. Can I order hard copy prints of my images? I work with a number of excellent print labs both in St. Louis and in New York and can provide you with beautiful prints in virtually any size you’d like. Pricing and delivery times vary. Rather than making your head shot in a studio in front of the proverbial gray backdrop, I specialize in custom and creative location portraits. Choosing the location for your head shot is a big decision. We will talk over your marketing strategy together and will find a location that will suit your particular needs. 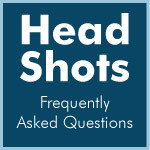 For a head shot, the best location is one that provides an interesting visual texture to the image and is aesthetically pleasing without drawing attention away from the most important part of the image: you! Can we shoot my head shot in at my office?